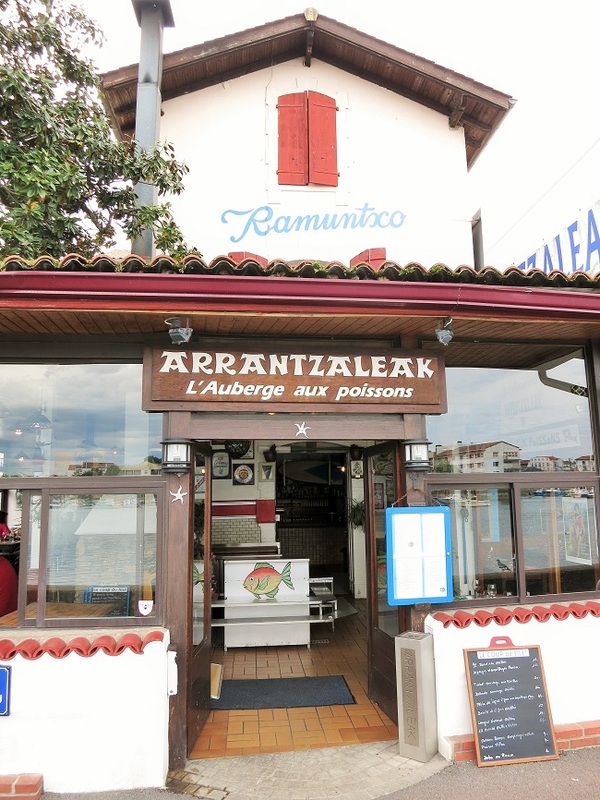 Located on a quiet street fronting the estuary of the Nivelle river, behind the fishing docks in the Basque coastal town of Ciboure, Restaurant Arrantzaleak doesn’t give the impression that it might be one of the best known restaurants in the region. The decor is modest, with even a bit of seaside schmaltz…the walls are decorated with fishing nets, colorful cork floats, mounted trophy fish, tables are wood topped and sky blue painted benches standing in for chairs. However, when we arrived, the table of 15 Chinese tourists near the door left no doubt that this was the place we had read about. Fortunately, Arrantzaleak, or “Chez Remunctxo” as it is known locally, lives up to the billing. The formula is simple: very fresh fish , grilled over hardwood coals (the grill is situated in a alcove that you pass through on your way to the bar), accompanied by fresh seasonal vegetables. Done. Although everything we tried was very good, selections from the daily fresh sheet were particularly good: grilled razor clams served with leeks, fava beans and asparagus; wild caught sea bass with more favas, pickled shallot and garlic butter; excellent whole prawns with persillade; and little flat fish called “langue d’avocat”, which resembled sand dabs and were served with herbed beurre blanc. This entry was posted in Restaurants and tagged Basque countries, Fish. Bookmark the permalink.